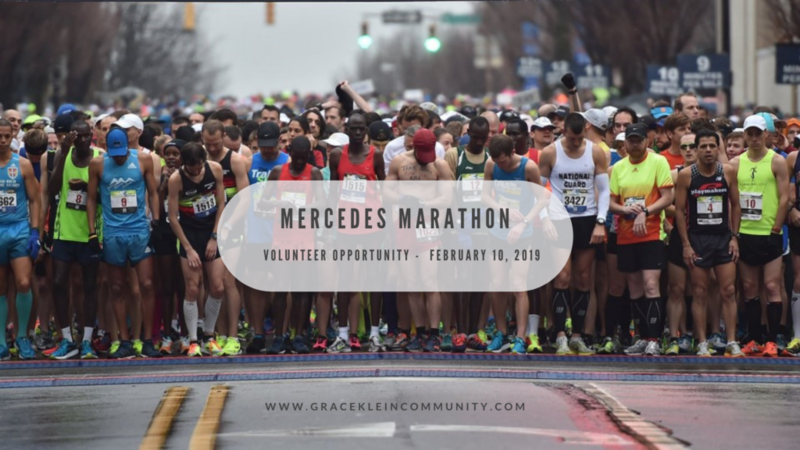 Grace Klein Community has been actively involved in the Mercedes Marathon discard pickup for over 9 years. We are the designated organization to collect the clothing and gloves that are shed by the runners involved in the marathon, and we need all hands on deck. The Mercedes Marathon staff and the Birmingham Police Department have complete authority over how/when/where the clothing gets picked up. The vehicle and volunteers MUST remain BEHIND the last runner on the course AT ALL TIMES!!! Volunteers are NOT allowed to be in the road anywhere near the runners – EVER. See #2 above. DO NOT pick up clothing items that are left on vehicles. Only pick up items left on the ground. Please follow basic rules of safety. If you’re in doubt whether something is safe to do it. If the Birmingham Police Department or Birmingham Events Staff would consider it unsafe, please don’t do it. The focus of the event is the runners so please be mindful of their safety at all times and cheer for/encourage them. We’ll be using a Golf Cart and trailer this year, so there will not be much room as in past years to ride rather than walk, so please prepare to walk majority of the race route. “It’s really a love story. The Mercedes Marathon, a test of endurance and determination, a goal that drives ordinary people to train for months, is really just a love story. During its second year, the Mercedes Marathon hosted the 2003 USA Men’s Marathon Championships in preparation for hosting the 2004 USA Men’s Marathon Olympic Trials. Using a multi-loop course proved to be an exciting venue for both athletes and spectators alike. The loop course idea was so successful, that both the New York and Boston Marathons used loop courses for the 2008 USA Men’s & Women’s Marathon Olympic Trials. Now in its 15th year, the Mercedes-Benz Marathon Weekend of events has become a Birmingham tradition. The event has helped to raised millions for local charities throughout its 15 year history.